A newly published study demonstrates how complex cognitive abilities can be incorporated into electronic systems made with neuromorphic chips. Novel microchips imitate the brain’s information processing in real time. 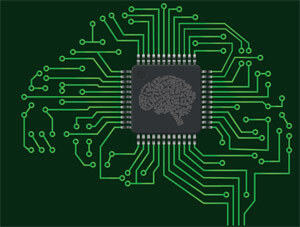 Neuroinformatics researchers from the University of Zurich and ETH Zurich together with colleagues from the EU and US demonstrate how complex cognitive abilities can be incorporated into electronic systems made with so-called neuromorphic chips: They show how to assemble and configure these electronic systems to function in a way similar to an actual brain. 1 Comment on "Neuromorphic Chips: Microchips that Imitate the Brain"
I’ve adapted this in my Sci-Fi thrillers”ORION”S BELT”. But I’ve taken it even farther into the realm of the unknown. I had the Scientists’ that create it, make it both intertwine in a miniature Nano state, combining robotic & biologic nano construction .In the 1st book “ORION’S BELT”Birth of the Hunter, I try to explain it in more synaptic detail. I wrote the manuscript & finished it in April of 2011. This is definitely the wave of the future, and I’m the first Science Fiction author to placate it.